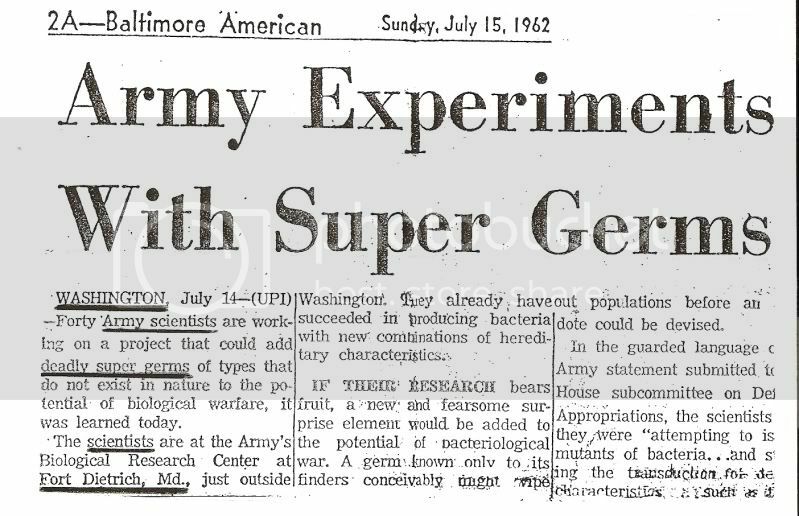 As soon as it was discovered in 1943 in the Caribbean Island of Trinidad, "across the street" from Venezuela, this nation equine virus –or VEE, short for Venezuelan equine encephalitis- caught the eye of the US military; their "Biowar Program" had just been installed and this virus offered good potentialities as a bioweapon. Too bad for horses, mules and donkeys but how does the VEE virus manifests itself in humans? 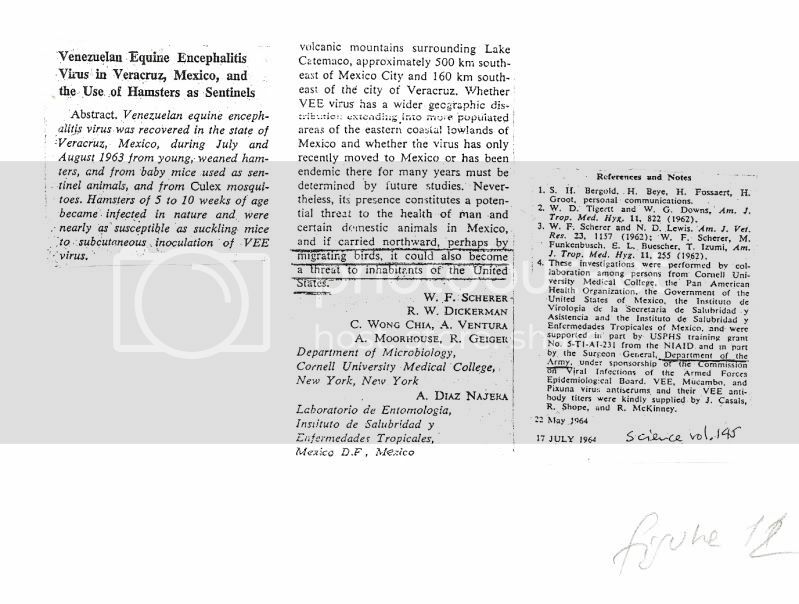 Considered technically a "zoonoses" –infecting both humans and animals- it produces sudden, very severe flu-like symptoms, muscle and headaches, plus high fever for 3 to 10 days; in children, furthermore, there may be somnolence, disorientation, convulsions, paralysis, coma and death…or neurological disorder sequels, -nice bioweapon, isn´t it?- The arbovirus producing the disease is transmitted by mosquitoes or arthropods, involving also wild animals and birds in the cycle. 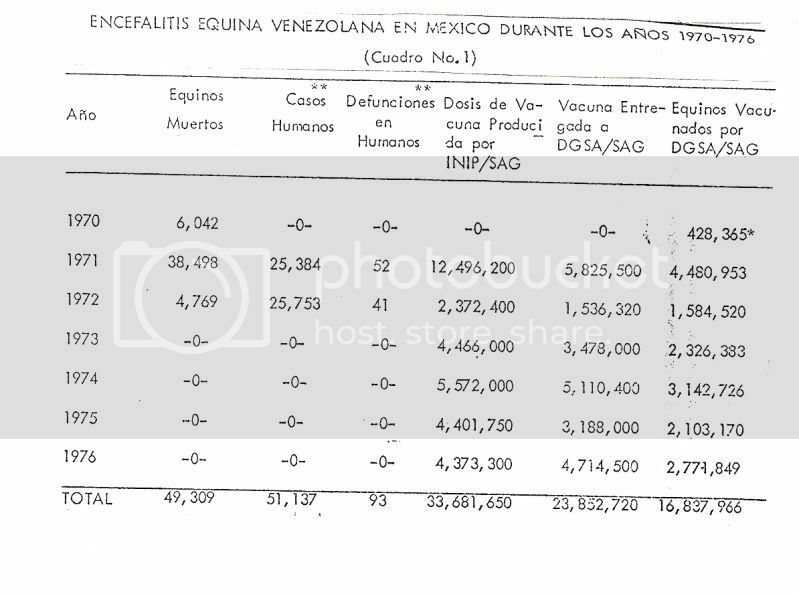 Known previously only in the Venezuela-Colombia region, the VEE virus was surprisingly recovered in Veracruz, México in 1964, and it´s translocation attributed "perhaps to migrating birds" ( 1 ). 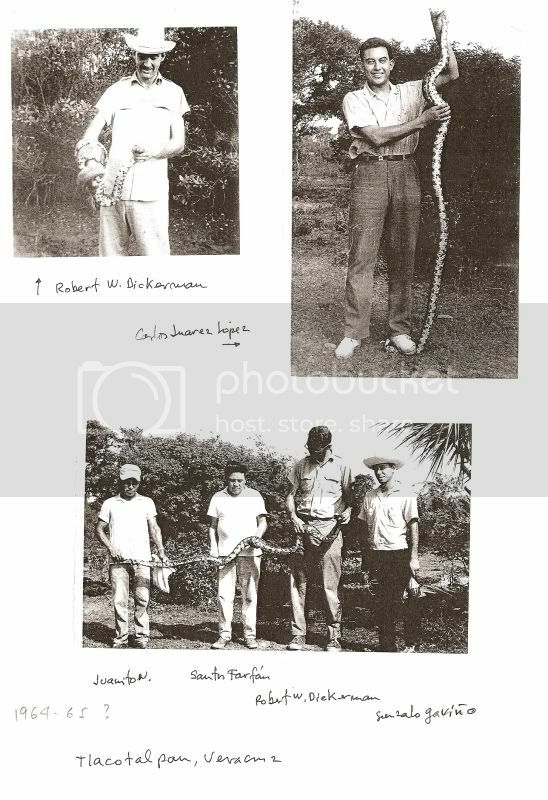 This event sparked a chain of studies on VEE in both Mexican Pacific coast near San Blas, Nayarit and Gulf coast near Tlacotalpan/Lake Catemaco in Veracruz under the support of The Smithsonian Institution of Washington –DC- . 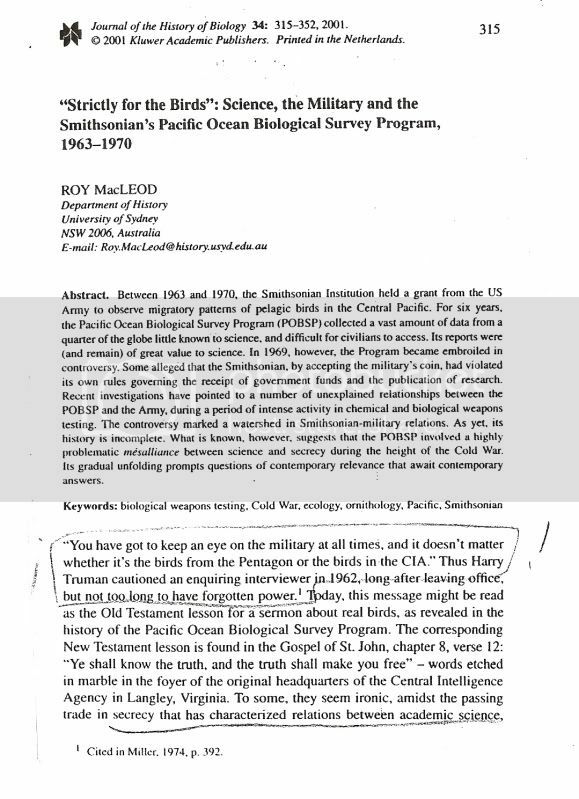 Simultaneously, this last source was beign accused of beign "a front" for the US Army with the purpose of studying the use of migratory birds as "vectors" or transports to disseminate microbes ( 2 ). 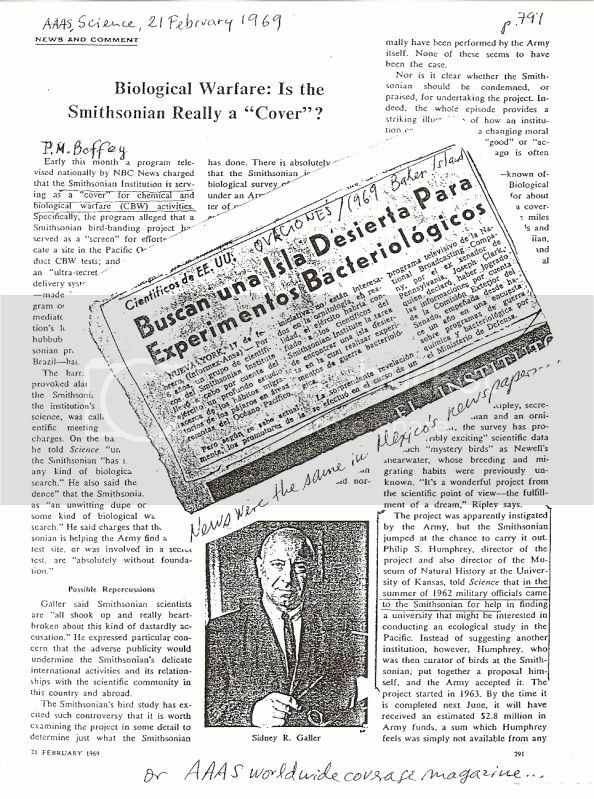 Two research groups were apparently formed, one led by Philip S. Humphrey from the University of Kansas and another, for México and Middle America, led by William Scherer and Robert Dickerman of Cornell University. 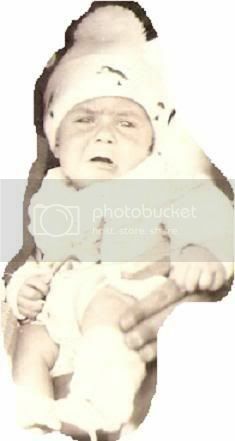 Both had "colossal" funds at their disposal ( 3 ), from the the official USA umbrella "Biowar Program" ( 4 ). 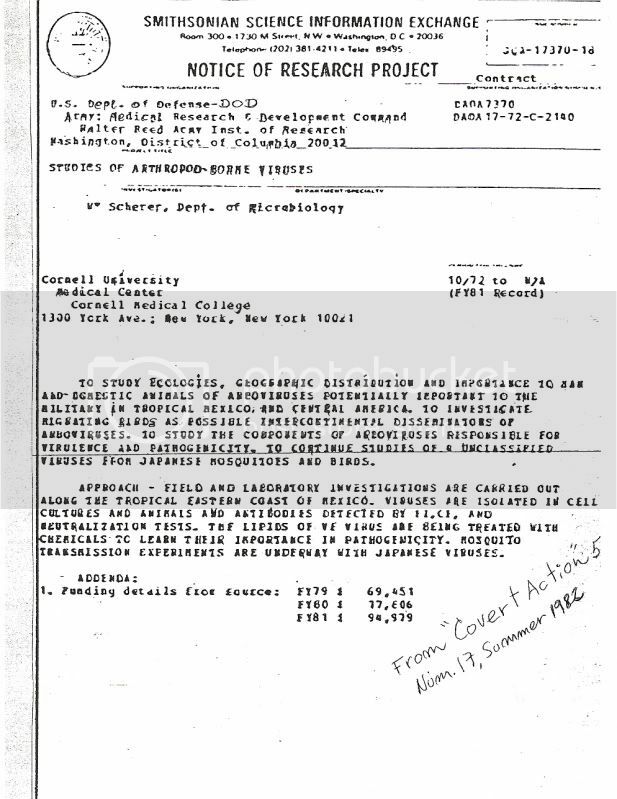 big money flowed for research teams of epidemiologists, physicians, microbiologists, virologists, veterinarians, biologists, bird traffickers…Fellowships for investigators and students were numerous and generous which makes me remember that in due time I interviewed a number of them such as one student working for his degree in ornithology (1963-1966); then young with a promising career ahead told me:…"At one point I did not like what we were doing…sitting still under jungle conditions, to count and identify –high power binoculars on hand- mosquitoes sucking blood from young nesting herons was extremely nasty…furthermore, it seemed to me I was working for some secret agency like CIA with dark interests behind…my poor unaware Mexican people kept me worried…in spite of the very attractive fellowship and career promises in US academia…I jumped out of the wagon…" ( 9 ). 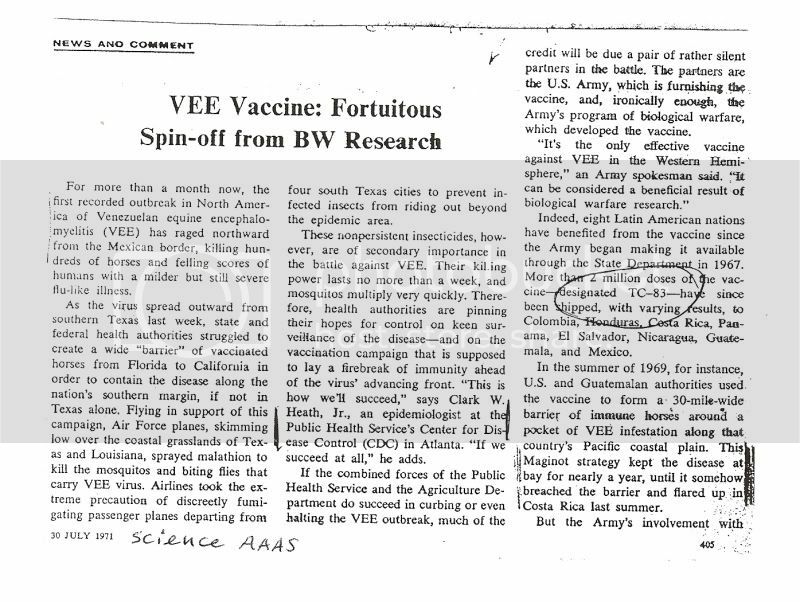 As said before, the VEE employed initially as a bioweapon in Vietnam ( 5 ) required the development of an specific vaccine and out of several prototypes, TC-83 was selected and tested in 6,000 individuals –possibly recruits- within the USA; considered an "investigational drug" –IND- not yet approved for its live virus character, then and now shouldn´t be used without permission and serious precautions taken and one is shocked about the permissiveness with which it was ceded? sold? franchised? 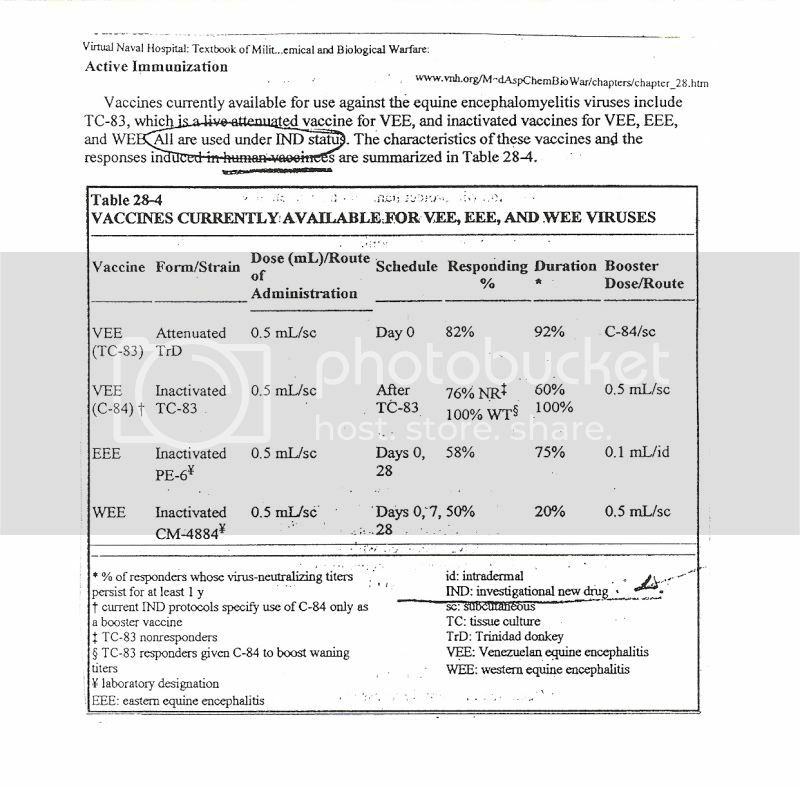 to México "to curb" the epizoodemic"... Not too much attention was paid in alerting Mexican authorities about the dangers of employing an "IND" type of live virus vaccine. 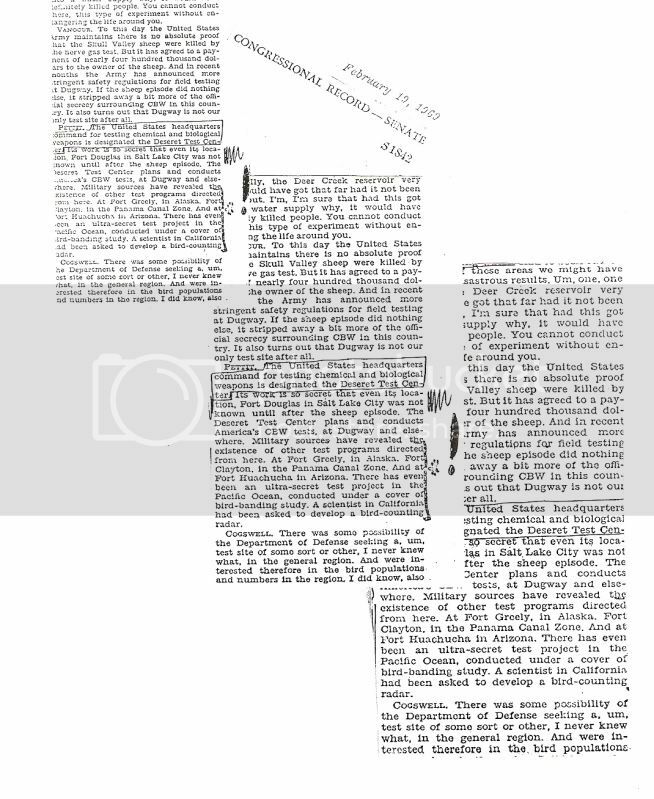 However, a few Mexican experts voice of alarm on this matter were raised, with their voice silenced by the then President Echeverría´s veto; after all those were the days of J.F. 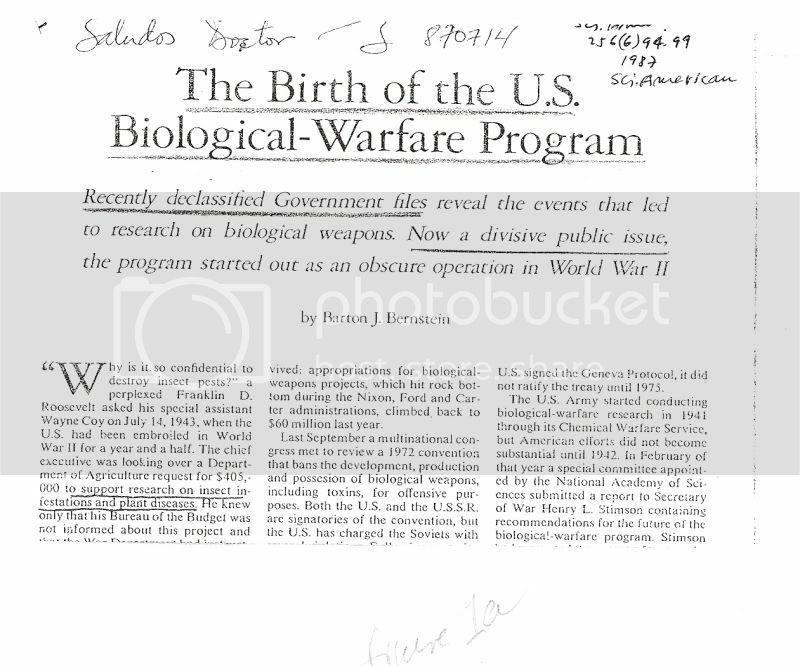 Kennedy´s "Biowar Project 112", Navy´s wide SHAD Program, biosabotage aggressions to Cuba, plus dozens of bioweapons tests in American cities and land ( 13 ) (14 ). 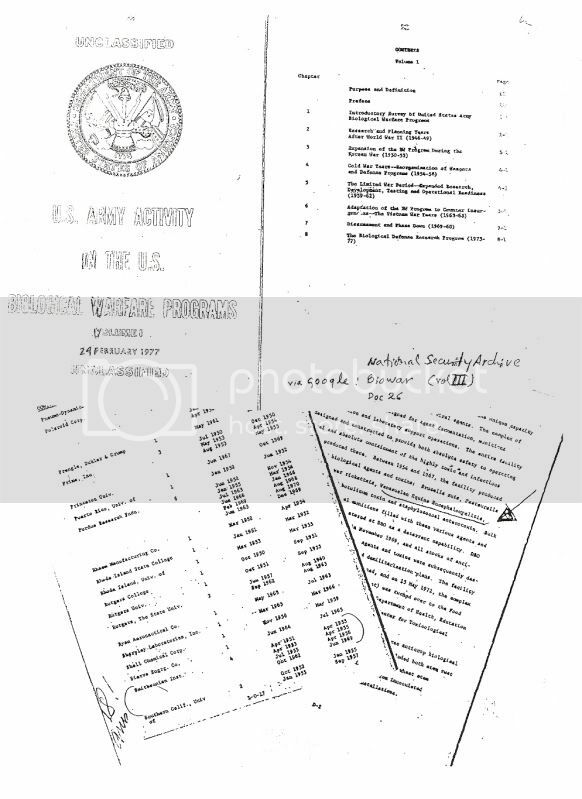 To make a long story short, VEE epizoodemic affected and infected, in the next 6 years ALL of the Mexican states but three, reaching –and alarming- the southern tip of Texas –mind you, where the famous affluent equine "King´s Ranch" is located- In the 1970-1976 period 29 million plus doses of TC-83 vaccine were produced in Mexican laboratories –"reporting daily to Fort Detrick".. (D. Batalla personal communication)- to vaccinate more than 14 million equines and additionally exporting 1.6 million doses; in those years, and in spite of vaccination, 49,209 equines died, 51,137 human cases developed the VEE disease and, sadly enough ¡ 93 ! 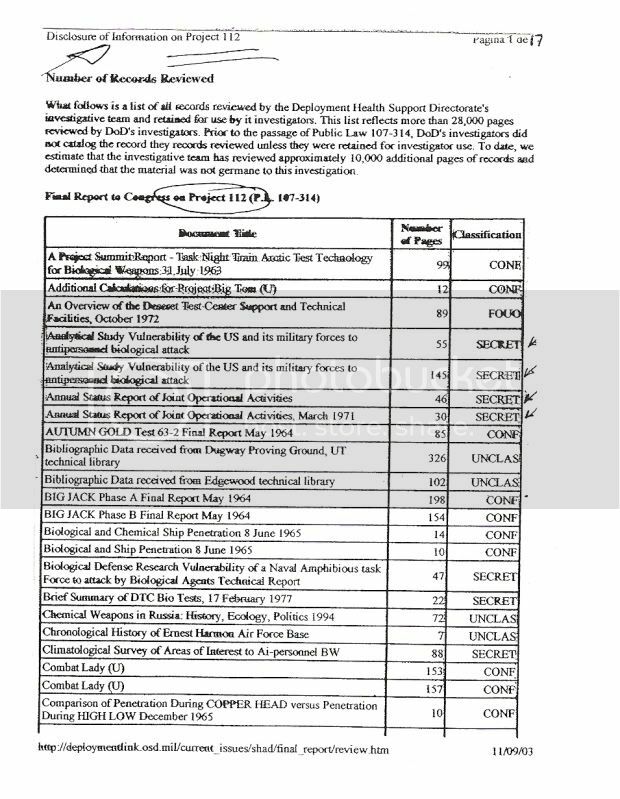 persons died –mainly children and elderly- ; mind you, 30 more than in the Sverdlovsk bioweapons "accident" in the former USSR or the 9 killed by "snail mail" anthrax after "11/9" in US...After surviving the VEE infection in México,an unaccounted high number of patients developed serious neurological sequels and surprisingly –however understandably- the full official Mexican sources statistics ( 15 ) have always been minimized by USA official sources ( 16 ). 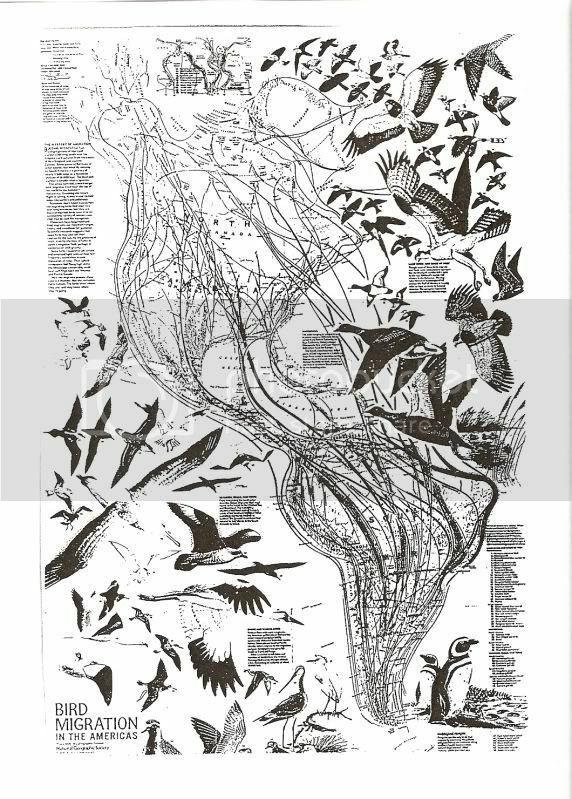 Este texto puede ser leido en español buscando el sitio www.cienciaydemocracia.com y entrar al capítulo 10 "¿Vecino Distante o Tonto Útil?" del libro "Bioterrorismo, Armas de Destrucción Masiva y Ética" que ¡ es gratis! Entrar a el para tablas, figuras y fuente de las mismas. THai is why we have to be double keen, alert,...good, here in México and in our former lands up north...¡ Viva Aztlán ! DARWIN CONOCIÓ MEXICO... O CASI.